From serene forests to pristine waterfalls, ancient temples to modern architecture and breathtaking landscapes to intense spirituality, India is filled with natural as well as man-made wonders. People from all over the world admit its genuineness and incredible history. This is the reason why India is one of the most-explored countries in the world today. Nellore is one such place which should be on the bucket list of every traveller or explorer on account of its appealing surroundings and historical significance. Looking for a reviving weekend getaway? Well, Nellore is your destination. Surrounded by lakes and waterfalls and dotted with ancient temples, this beautiful town is located on the banks of Penna river. It is believed to be in existence since the time of the Chola dynasty and has played a crucial role in the evolution of the Telugu language. Ruled by the Cholas, Mauryan dynasty, Pallavas, Vijayanagar Empire, Mughal Empire and British, the history of this town is quite old and interesting. Being one of the hottest cities in India, it is difficult to roam around in the summer season. If you don't want to feel uncomfortable due to its extreme climatic conditions and save yourself from the scorching heat of the sun during hot and humid summers, then the best time to visit Nellore is from October until the end of March. By Air: If you are travelling to Chennai by air, then you can take a cab directly from the Chennai airport to Nellore, or take a cab to Chennai City and from there take a bus to Nellore. The Chennai airport is at a distance of 190 km from Nellore. However, the nearest airport to Nellore is Tirupati Airport which is at an approximate distance of 122 km. By Rail: Nellore is well-connected to Chennai and other major cities by rail. You can catch a train directly from Chennai Central to Nellore. It is one of the most preferred modes of transport on this route and will take an approximate time of 3 hr to reach Nellore. 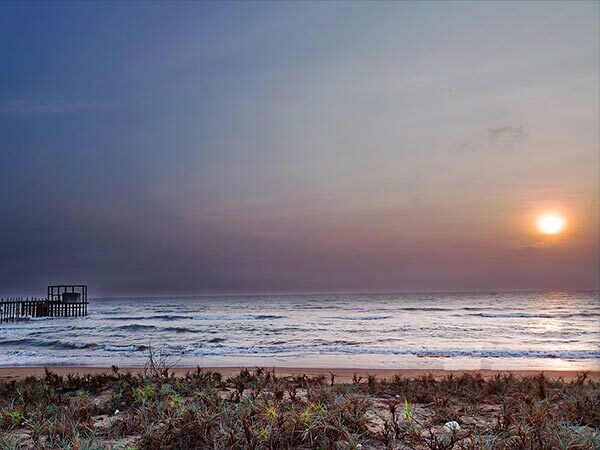 By Road: Situated at a distance of 175 km from Chennai, Nellore is easily accessible by road. You can either take a bus from Chennai to Nellore or drive on your own. If you are looking at reaching Nellore within minimum time, then it is advisable to either book a cab or drive on your own. The road journey from Chennai to Nellore is full of excitement and thrill. You will come across temples, lakes, tanks and scenic landscapes. Undoubtedly, if you are heading to a weekend getaway from Chennai, then it is impossible to bypass Puzhal Lake. Over a period of time, it has become the foremost stoppage for every traveller leaving Chennai. Located at the base of Red Hills, it is one of the major rain-fed reservoirs and has been supplying waters to the nearby cities and towns. Built in 1876 during the British era, Puzhal Lake has also been attracting travellers on account of its scenic beauty at the time of dawn and dusk. One can feel the essence of calmness and serenity all around this irresistible lake. Situated on the Coromandel coast of south India, Pulicat is popular for its lake and bird sanctuary. Every year millions of tourists can be seen here savouring the spectacular views of the wondrous lake and different species of birds whispering the music of quietude in the sanctuary. Pulicat is also famous for its Dutch cemetery, which has been lying behind the Pulicat market since its formation. Pulicat was an important trade centre during the Dutch and Portuguese era; hence, due to its historical significance, it has become a major tourist place over a period of time. If you are looking forward to savouring the unimaginable mix of history and nature, then it is a must-visit stoppage for you. A small village located in the Nellore district, Nelapattu is extremely popular for its bird sanctuary where tourists and picnic-lovers come in thousands of numbers every month to watch migratory birds flying past several borders to feel comfortable with the surroundings. Spot-billed pelicans are known to have a large nesting colony here, thereby, making them the centre of attraction. The other birds which may surprise you include the night heron, openbill stork, coot, darter, etc. If you are an avid bird-lover or photographer, then this place is your calling. After making your journey filled with amazement and thrill already by visiting these wonderful sanctuaries at Pulicat and Nelapattu and dazzling lakes of Puzhal and Pulicat, you will be on the land of Sri Ranganathaswamy Temple i.e. Nellore. Once you have reached this beautiful town, you will be on your way to explore things. Sri Ranganathaswamy Temple is the major identity of Nellore. Dedicated to Lord Ranganatha, this temple is believed to be built in the 12th century and since then, it has been a major Hindu temple in Nellore. Several statues and a wide range of pattern can be seen on the top of the temple. Being one of the oldest temples, it attracts devotees in thousands of numbers every month, especially during the period of Brahmotsavam. If you are looking forward to getting involved in the grand festival of Sri Ranganathaswamy Temple, then you need to visit it during the months of March and April. Located at an approximate distance of 25 km from Nellore, it has become a perfect weekend getaway for the locals. During the time of dawn and dusk, you can watch numerous people enjoying the spectacular views created by the presence of colourful sky and cool breeze enhancing the charm of the surroundings. If you want to take a break from the history of Nellore and get immersed in the beauty of some natural wonders, then Mypadu Beach is your destination. You can also indulge yourself in the water sports and take an unforgettable ride on small cruises. If you have wanderlust and desire to extend your boundaries, then Penchalakona is the place you must visit. Located at an approximate distance of 70 km from Nellore in the Rapur Mandal of Nellore, this small village is famous among unconventional travellers for its waterfall, the valley featuring exotic charm and dirt-free environment and assuredly, the Penusila Lakshmi Narasimha Swamy Temple. You cannot restrain yourself from this valley, which is full of surprises. Do not miss the chance of getting bewitched by its captivating beauty. If you desire to celebrate the grand festival happening every year at the temple, then you can visit this place during the months of April and May.